The Guild Master in the Champions' Guild. You need at least 33 quest points earned from other quests. You should have a teleport for when you have beaten Elvarg, but it's not required. Oziach will tell you that although you may be in the Champions, you may not be worthy to be called a "Hero". He will set you off on a quest to kill the mighty dragon Elvarg on Crandor Isle. You will need to collect three map pieces to get to the isle. Return to the Guild Master, and he will tell you that Duke of Lumbridge has a special shield that is enchanted against dragon’s breath. To fight Elvarg, you will need to obtain an Anti-Dragon breath shield from the Duke. Duke Horacio is found on the second floor of Lumbridge Castle. Talk with him, and he will give you the shield. Note: If you ever happen to lose the shield, return to the Duke and he will give you another. Lozar’s map piece is the easiest of the three to obtain. This piece only requires you to have level 33 magic. Go to Port Sarim Jail and find Wormbrain, kill him to get the map piece and use telekinetic grab on the map. If you don’t have level 33 magic you could just buy it from him for a hefty 10,000gp. If you aren’t going to pay the 10,000gp, you will need to bring along items for magic or ranged attacks and have one law and air rune, to cast telekinetic grab. After doing so, you will then have the one of the three map pieces. Now head over to the Ice Mountain north of Falador to speak with the Oracle. If you already bought the required items for this stage then you can continue straight on, if not, read the next step to find out how to easily obtain the required items. Atop Ice Mountain, speak with the Oracle and bring up the topic of the map, she will tell you that you need several items before you can enter the room containing the second map piece. A piece of silk, (Al-Kharid for 2 gp or 55gp if you buy from the clothing store in Varrock). Take the items down to the dwarven mine and climb down the ladder. Use all four items with the door. Once you have done this, you can then enter the room. Open and search the chest in the centre, it will contain the next piece of the map. Melzar’s map is the hardest of the three to obtain as you are required to defeat a level 82 Lesser Demon. It is recommended that you bring lobsters or swordfish (something that heals well) if you are a lower level as well as good armor and a good weapon. If you are worried at all about your safety, bring teleport runes, just in case. When you enter, you can see Zombie Rats; just kill them until you get the Red Key. Once you have this key go in the door that is in top left hand corner. Now you get in a room with Ghosts, do the same as on Giant rats; kill them until you get the orange key. Once you have this key go in the door that is second from the ladder that you came from. Climb up the ladder and you land in a room with Skeletons. Again, you have to kill them to get the key. Now you get in a room with Skeletons, do the same as before; kill them until you get a yellow key. Once you have the key, enter the southwestern door and then follow the corridor and down the ladder, keep going down the ladder until you get underground. Now, you're in a room with zombies, and you will see a door with no colour. Don't enter it, but start killing zombies until you get the blue key. Go through the door to Melzar the Mad, he will say weird things like "Let me drink my tea in peace!" or "Feel the wrath of my feet! ", but kill him to get the purple key. This is the last monster, and the strongest: Lesser Demon. You only need to kill him once, so don't worry, he will drop the last (green) key. Go in the door that is North of the location of the Lesser Demon. Open the Chest and Search it, now you got the last Map Piece. Now that you’ve obtained all three map pieces, you need a boat to travel on to get to Crandor. Firstly you need 3 planks, 90 nails, hammer and 2000gp. Talk to a guy that is on the very end of Port Sarim harbour and offer to buy the boat, he will ask for 2000gp. A boat for 2000gp? BARGAIN! But there's just one problem with the boat, there's a big hole in it. Oh well, that’s where the 3 planks, 90 nails and a hammer you brought with you come in handy. Use all three planks one by one on the hole; now you got your own working boat, you are so lucky, now you can go to Crandor... One problem, who is going to get the boat to Crandor? You need a Captain. Go to Draynor and find Ned the Fisherman and ask him if he would help you get to Crandor Isle. He will say yes, now he is waiting for you at the boat. Bring with you some lobsters and a good weapon (NOT a 2-handed weapon! ), and the Anti-Dragon Shield that the Duke of Lumbridge can give you. You don’t have to have this exact equipment, but it is a suggestion. Don’t forget to bring your Anti-Dragon breath shield otherwise it will make surviving a much more difficult task. Note: Members can use the dragonfire shield. You need a food that heals a lot of Hp as Elvarg hits for up to 100! It is also suggested that you bring along some teleportation runes just incase. A strength potion is also another suggestion, but isn’t vital. Retrun to the Boat, and board it. Tell Ned that you are ready to go and you will set sail. Elvarg will attack the boat and the set it on fire, killing Cabin boy Jenkins in the process. You will crash into some rocks when you get to Crandor and the boat will be destroyed. Remember to bring and equip your anti-dragon shield! Take this path to get to Elvarg, beware you have to pass by Moss Giants. Once you get inside keep walking in until you find a wall. This is a good point to take a dose of your strength potion. Climb over the wall and head towards the dragon. Beware of your health at all times, and if you start to run out of food, teleport out and try again. There's no real tactic to the fight if you choose to tackle it with melee so simply stand there and take Elvarg's hits while trying to get her health down as quickly as possible. If you successfully manage to defeat the dragon you will cut off Elvarg’s head, go west out the secret door to unlock a shortcut between Karamaja and Crandor. Take the head back to Oziach in Edgeville. 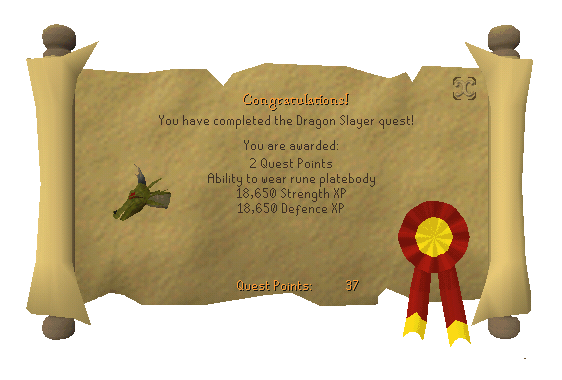 Congratulations you have now completed Dragon Slayer and have earned the right to wear rune platebodies!